Mahindra & Mahindra has been testing the all-new Thar on-off road SUV over the past few months. In recent weeks, the 2020 Mahindra Thar test mules have begun wearing a new top-hat that shows a marked different from earlier test mules. The new top-hat is what the production version of the 2020 Mahindra Thar will feature. Based on cues from this, here is a speculative render that shows what the new Thar could look like. 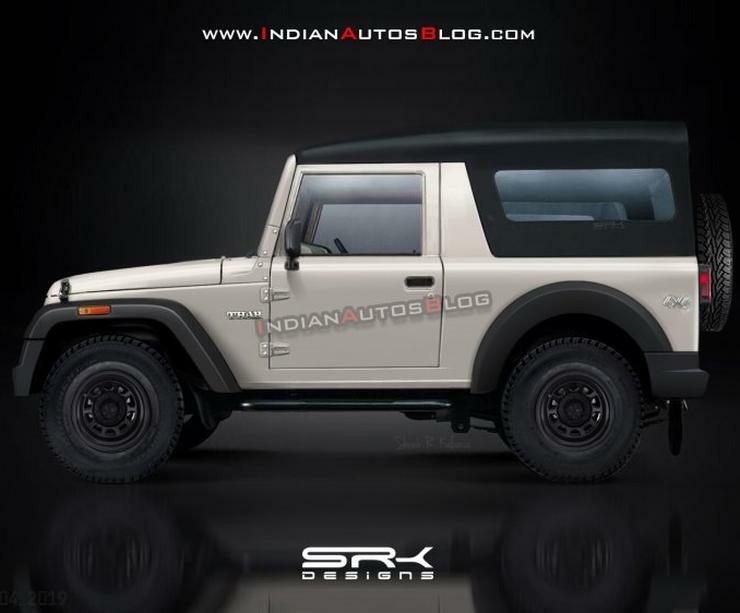 From the render, it’s clear that the 2020 Mahindra Thar will get a very different profile design. The off-roader could get a rounded belt-line, which seems inspired by the previous generation Land Rover Defender, and a rising roofline. The roofline seems reminiscent of the Mahindra Invader, a Bolero-based lifestyle MUV that was sold in India about a decade ago. Other key styling cues include an inclined front windshield and A-Pillar – a-la-new-Jeep-Wrangler – and expansive fenders both at the front and rear. The bonnet also gets a fair amount of inclination, possibly with pedestrian safey crumple zones built in considering that the new Thar will also be exported to multiple developed markets of India, which have stringent safety norms. Talking safety, the new Thar – which will debut in India post September 2019 – will have to meet new safety norms under the Bharat New Vehicle Safety Assessment Program (BNVSAP), which also necessitates crumple zones, pedestrian safety and many other essential safety features. Airbags, ABS, reverse parking sensors, provision for ISOFIX child seats, speed alerts and seat belt reminders will be standard safety features on the new Thar. The 2020 Thar is also expected to get steel wheels as standard, with alloy wheels available as an option – most likely as a Mahindra genuine accessory. The bonnet gets new latches, again inspired by the Jeep Wrangler. Front end styling of the new Thar is expected to retain the Jeep design with the traditional 7 slat bonnet while the doors have lower set handles. The rear-end styling seems to get new tail lamps while the traditional spare wheel mounted on the rear door continues unchanged. The rear bumper is also likely to get a full redesign. The new Thar is expected to continue with independent front suspension and leaf spring shock absorbers at the rear. A four wheel drive layout is also expected to be standard with the top-end CRDe variant. The 2020 Mahindra Thar will receive an all-new, 2 liter-4 cylinder turbocharged diesel engine with about 140 Bhp of peak power and 320 Nm of peak torque, which represents a healthy increase from the current 2.5 liter CRDe motor’s outputs of 105 Bhp-247 Nm. A new 6 speed manual gearbox is likely to be standard, and it remains to be seen if Mahindra will offer an automatic gearbox on the new Thar considering the fact that the new engine will get a 6 speed automatic gearbox on other SUVs that it’s offered with. « 120 Bhp Mahindra Scorpio Vs 15 Bhp Suzuki Gixxer SF drag race: Who wins?